Nissan 350Z converted from carbon as an addon car, meaning no other car gets replaced. - Added mount points (lights, spoilers ecc). - Various adjustments to mount points: now every bodykit has its own exhaust points, removed rearlights from bodykits that do not have them. - Brakes rotor now stays closer to the rim. - Minor fixes to brake rotors/calipers. - Merged all ModScripts into one. - Minor improvements to meshes. - Added hoods, decals, numbers and license plates. - New stock color: darker yellow. - Added option for 1024x or 512x vinyls. - Removed some _E lods. 1- Copy the folder "Cars" to NFSMW installation folder, choose the vinyls (1024x or 512x) and copy its contents to NFSMW installation folder. 2- With NFS-VltEd: File, Import -> ModScript. 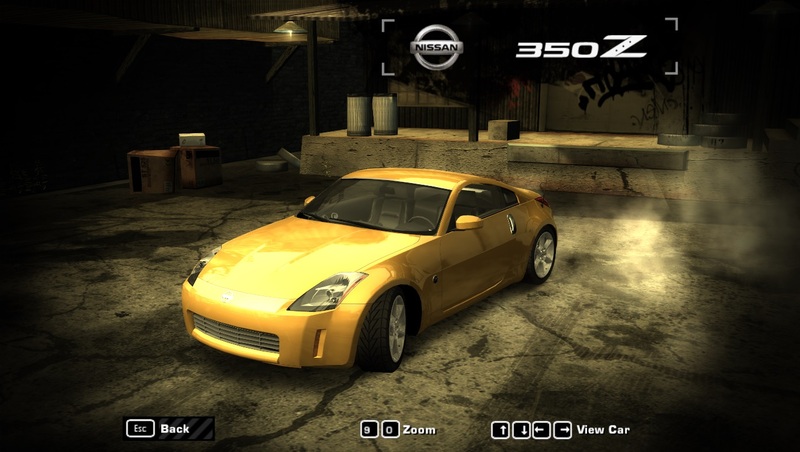 Select 350z.nfsms. 3- Open NfSMW - ReCompiler.exe (located in "ReCompiler" folder) and run: FRONTEND -> FRONTEND, GLOBAL ->GLOBALB, LANGUAGE. 4- Copy FrontA.BUN to "FRONTEND" folder. Copy GlobalB.BUN and GlobalB.lzc to "GLOBAL" folder. And all the language files to "LANGUAGES" folder of the game installation folder. 5- Make sure you don't have ModLoader. Run the game and make a new save. - Tell me if there are any issues. - Arushan for NFSMW Mod Tools. - nlgzrgn for NFSMW Unlimiter. @Zvott96 Wow! Thanks, and you can throw out ready files on Google.Drive, I'm afraid to just make a mistake in the installation and thereby spoil the game, thanks in advance! Happy New Year!